We would like to thank everyone who helped with our Annual Book Sale on Saturday, August 4th, 2018. We appreciate all the hard work of the volunteers who helped move books outside on Friday to place them under the tents by category, as well as the many helpers who staffed the check-out areas on Saturday and helped clean up everything afterward, despite the deluge of rain. 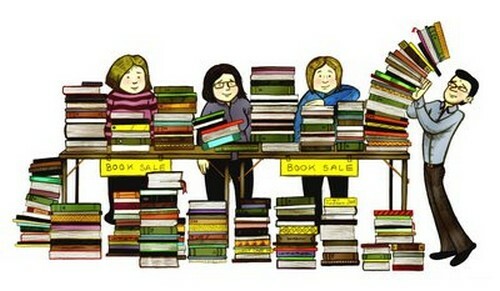 Finally, thank you to everyone who attended our sale — as you know, the money raised benefits our wonderful library. We thank you all for your patronage. 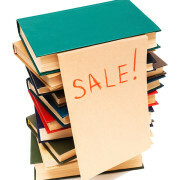 The Friends of the Brownell Library will hold their annual book sale Saturday, August 4th, 9am-3pm. The sale will be located on the back patio under the tents. Admission is free, so be sure to stop by and stock up on your summer reading. We are no longer accepting donations for the book sale. If you would like to help set up or work at the book sale, especially moving books the Friday beforehand, please contact Dee Holliday at (401) 635-2384. Community service hours available if needed. Please Note: The library building will be closed all day during the sale. 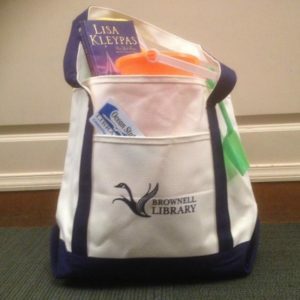 Support your library with the purchase of one of our new canvas tote bags! On sale for $20, these bags are perfect for carrying books, bringing along to the beach, or for shopping. All proceeds benefit the library. Only a limited amount of bags available, so please visit or call the library at 635-8562 to reserve yours. Made possible by the Friends of the Brownell Library.